March 16, 2005 calendar page. Available as kit (2 skeins allhemp6 + pattern) only. This easy bag has lots of stretch in all directions so you can fill it to the max. Knit in the round using the popular purse stitch pattern, the bag knits up quickly. Knit in allhemp6 for an extremely durable bag that will last forever! 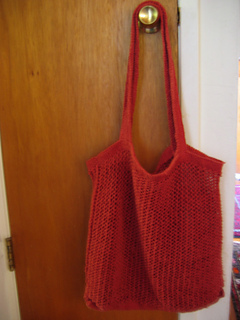 Eco friendly shopping bag in two sizes is knit in the round in hemp yarn. The Little Shopper is 12” long, the larger Shop ‘til You Drop bag is 17” long. The purse stitch pattern is very stretchy and easy to knit.